Keerla palya is one of the popular side dishes of Konkani cuisine. 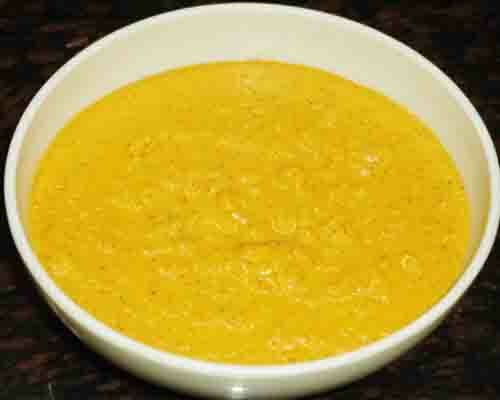 This is one of the best side dishes which goes well with rice and chapathi. 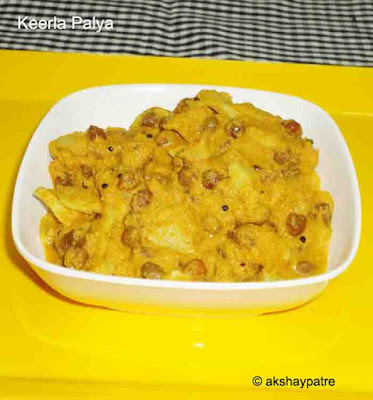 The keerla palya requires tender bamboo shoots and chickpea. 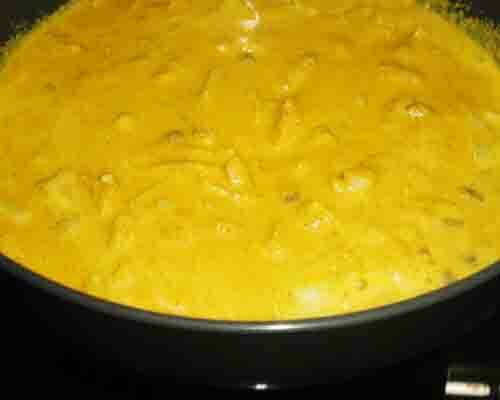 This is prepared in coconut based masala paste. Bamboo shoots are not available here where I am currently staying, therefore I could not take a photo of the whole bamboo shoots. But I got a box full of chopped frozen bamboo shoots from my native. I just soaked them in water for an entire day by changing water at regular intervals to remove the bitterness of the bamboo shoots. Bamboo shoots are available with hard brown colored layered outer cover and you have to peel them off to get the tender white colored bamboo shoots for curry. 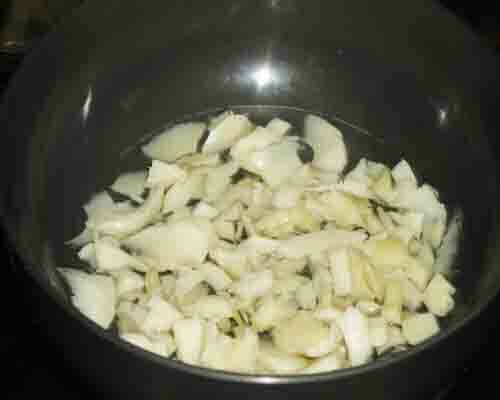 Then these bamboo shoots are chopped and soaked in water by changing the bitter water several times before the use. Every house hold has its own version of making dishes of bamboo shoots. This is my version which my family likes a lot. 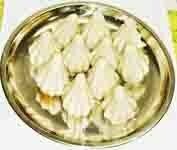 Bamboo shoots are also used to make sukke and phodi. Curry made in combination with sprouted green grams, fresh green peas and toor dal also tastes great. This coconut based curry is flavored with fried coriander seeds, fenugreek seeds and spluttered mustard seeds. I have used a very small quantity of tamarind in this dish as I like it in the dish which increases the taste especially when having with hot rice. But it is totally optional and you can skip it. Peel the outer hard brown coloured cover of the bamboo shoots until you find the tender white portion. discard the brown hard cover and use only white portion of the bamboo shoots. Chop this bamboo shoots and put them in a large vessel. Add sufficient water and keep aside. After every 5-6 hours drain water and add fresh water to it. Repeat this process for an entire day and then the bamboo shoots are ready to be cooked. 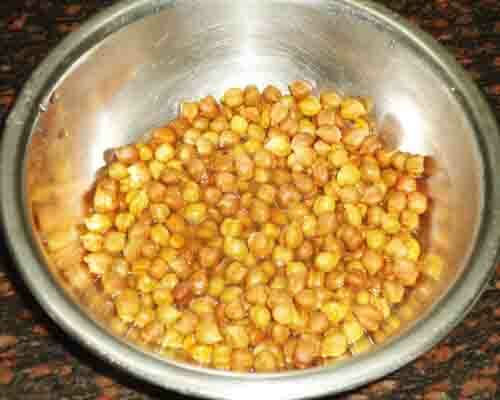 Rinse and soak the chana in sufficient water for 7-8 hours. Put them in a pressure cooker and take 3- 4 whistles. Do not over cook till they become mushy. Put the ingredients mentioned under "grind to paste" in a mixer jar and grind it to a smooth paste using very little amount of water. 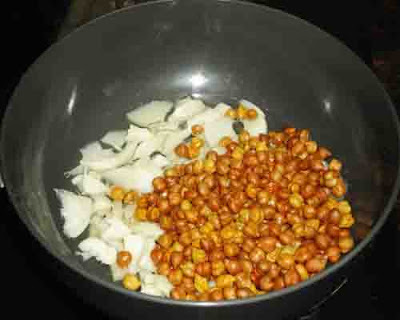 Add the boiled chana to the cooked bamboo shoots. Add the masala paste and salt. Add water if required. Bring it to boil and simmer till you get the desired consistency. The palya should be thicker than currry. 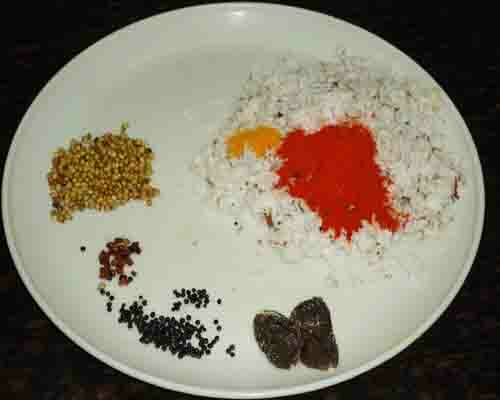 Make a temperimg with the ingredients mentioned under "for the tempering" and pour it on the keerla palya and mix. 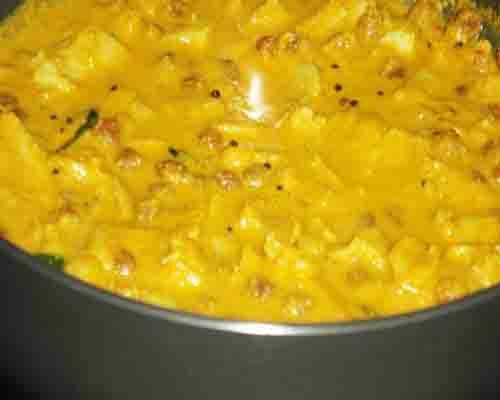 Serve the keerla palya hot with rice and chapathi. Do not cook bamboo shoots without soaking and changing water several times. If you use them directly the dish may taste bitter. You can also use sprouted green grams, toor dal and green peas in the place of brown chickpea. I have used basic spices such as coriander seeds, mustard seeds and fenugreek seeds to get the traditional taste of the Konkani cuisine. However you can use any sabzi masala instead of these spices. 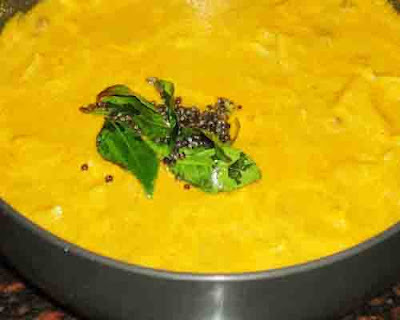 Please use only small quantity of fenugreek seeds to avoid extra bitterness in the curry. 1. Chop this bamboo shoots and put them in a large vessel. Add sufficient water and keep aside. 2. After every 5-6 hours drain water and add fresh water to it. Repeat this process for an entire day and then the bamboo shoots are ready to be cooked. 3. 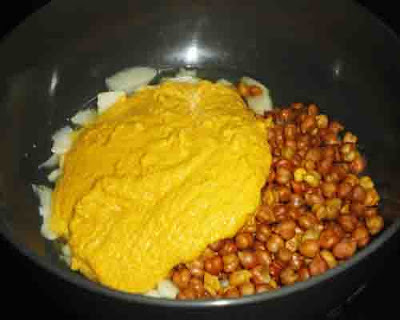 Rinse and soak the brown chickpea for 7-8 hours. Drain water and add fresh water. Cook in a pressure cooker and take 3-4 whistles. 4. Boil water in a large pot and add chopped bamboo shoots. Cook till they become soft. 5. Add the boiled chickpea to it. 6. 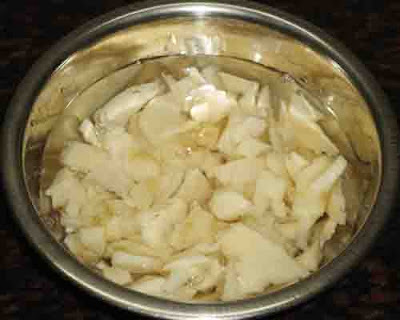 Grate the coconut in a large plate. Fry the coriander seeds, methi seeds and mustard seeds. 7. Put the above shown ingredients in a mixer jar and grind it to a smooth paste adding very little water. 8. Add the masala paste to the boiled chickpea and bamboo shoots. 9. Add salt and mix well. Add water if the gravy is too thick. Bring the sabzi to boil and simmer till you get the thick consistency. 10. Make a tempering with curry leaves and mustard seeds. Pour them on the bamboo shoots sabzi. 11. Mix the tempering till it combine well. 12. Serve the keerla palya or bamboo shoots sabzi with rice and chapathi. My childhood memory refreshed as my mom was used to make such curry with a slightly different version. Bamboo shoots were abundantly available in murudeshwar where farmers were bringing them from forest. Thanks for this recipe.